ShadowBox is a tool which is able to create all kinds of 3D primitives based on the projection of shadows toward a center volume. Use masks to paint the front, side and bottom shadows of a model onto the dedicated cubic ShadowBox and your model will be dynamically generated inside it! The main purpose of ShadowBox is to create whatever primitive you need with a few strokes, ready for additional sculpting. It is not meant to sculpt and refine models or create finely detailed models. ShadowBox is based on the Remesh All function and is resolution dependant: A low resolution setting will create few polygons and a rough shape while a high resolution setting will create a lot of polygons and a more accurate shape. It is strongly advised to use a low resolution setting wherever possible and then later subdivide the model while sculpting with ZBrush 4’s many brushes rather than trying to use ShadowBox with a high resolution to create overly accurate masks or detailed base meshes. In other words, use ShadowBox to create the lowest resolution base mesh that can be used as a starting point for your sculpts! ShadowBox is in fact an editing mode. You must first have a Polymesh3D object selected before activating ShadowBox, which is located in the Tool > Geometry menu above the ClayPolish section (or the Tool > SubTool menu under the Remesh section in ZBrush 4). Your object will then be converted to its shadow representation: The front, side, and bottom shadows of the loaded object will be projected as masks on the corresponding planes and the mesh will be reconstructed as you edit these masks. This process will display the original mesh with shadows cast on the three ShadowBox planes. This is however dependent upon the Resolution set before activating ShadowBox mode. If you want to create a new shape and not start from an existing one, you must load one anyway. 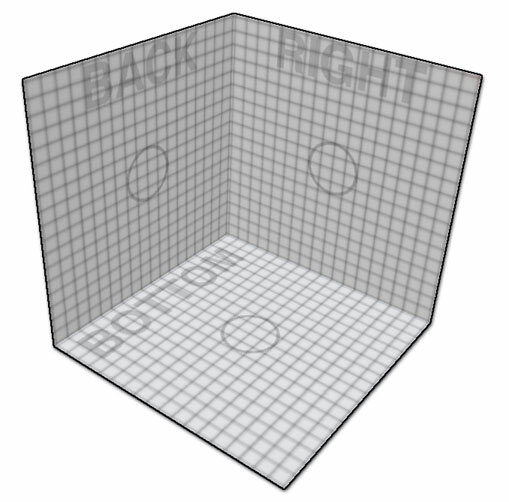 The fastest solution is to load a primitive like the Polymesh3D and then clear the converted masks that will be projected (as described above) on the ShadowBox walls. ShadowBox uses masks to represent the shadow. To edit the shadow you must use the regular Mask brushes and operators. As ShadowBox is an editing mode, your original 3D model will be lost. If you want to keep a copy of it, create a clone before activating ShadowBox. An alternative way is to load one of the ShadowBox projects found in Light Box. Bear in mind that loading a project will delete all custom objects currently in the Tool palette. Switch your display mode from perspective to orthogonal view (P Hotkey). Turn on Ghost transparency (found on the right shelf or in the Transform palette). This will prevent the 3D object from obscuring the masks on the projection planes. Set the resolution of ShadowBox before starting to work on your construction (see below). Avoid going in and out ShadowBox several times when creating your model. Each time you go back into ShadowBox, ZBrush will evaluate the projection shadow and rebuild your mesh, which can destroy some changes that you’d made outside of ShadowBox. Once you are ready to work in ShadowBox, start to draw your masks on the Back working plane. If you need to create only a kind of extrusion based on a single projection, it is advised to work in this plane to get the cleanest mesh. With each new stroke, thin lines will be created on the three working planes to show the bounding box of your model so far on all three views. This helps you to know where you can safely continue masking on the other working planes: ZBrush will build a model in the center of the box which can be described by the existing masks. If you create a mask on one side and a second mask on another side which is not aligned with the existing mask, only the part in common will be created. Don’t forget that you can erase masked areas by holding the ALT key at the same time you are using Ctrl. You can also combine the mask with the new Stroke types (Circle, Square, Curve) or use the new masking brushes (Mask Rectangle, Mask Circle, etc.). 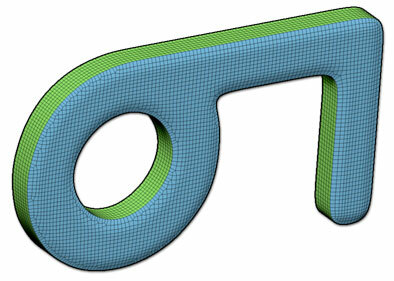 Do not forget to use the LazyMouse and Backtrack features to get crisp lines for hard-edged meshes. When your model is finished in ShadowBox, just turn off the ShadowBox switch. Your new base mesh is now ready to be sculpted with all the ZBrush brushes. ShadowBox objects are based on ZBrush’s Unified Skin technology. This technology uses Voxels, combined with the Remesh All functions. By changing the Remesh All settings, you will affect the quality (and results) of the ShadowBox object. Different results by ShadowBox resolution: 1: 32, 2: 64, 3: 128, 4: 256. The difference is minimal between 128 an 256, except for the sharper edge angles. 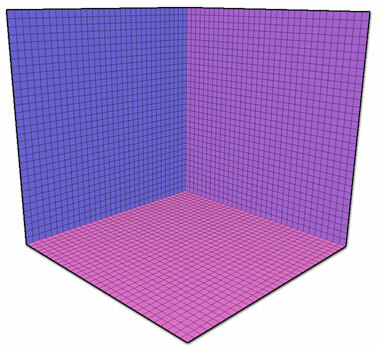 Use the ReMesh Resolution slider to Increase or decrease the polygon count of your ShadowBox object. With a default resolution of 128, your ShadowBox object will be described in a cube of 128x128x128. If you need to create accurate objects with no subdivision levels directly in ShadowBox or if you only plan to add a couple subdivision levels while sculpting, increase this resolution. If you need to create a rough base mesh which you will then do important sculpting on, keep the default resolution or even decrease it. 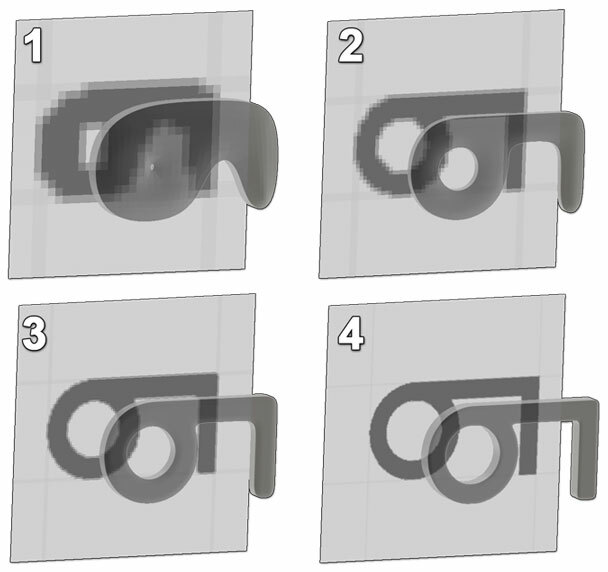 By increasing or decreasing the resolution, your Mask will be more or less accurate. Change the ReMesh Resolution slider value before activating ShadowBox. If you need to change it while in ShadowBox, turn it off, change the resolution and activate it again. Change the Polish slider if you want to have sharp or soft edges on the mesh. By clicking the circle, you will affect the type of Polish: an open circle will maintain the overall shape while a closed circle will smooth the edges. By toggling the Polygroup option you can create automatic Polygroups based on the shape you are creating within ShadowBox. 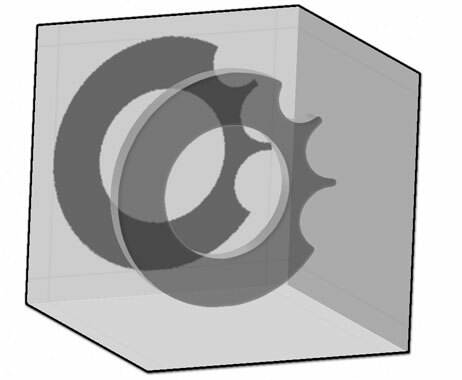 Two polygroups have been created for this single-plane projection model: One for both faces and another for the extruded sides. 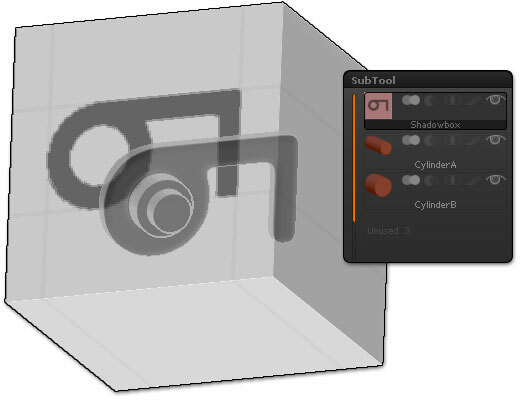 ShadowBox can’t work with SubTools directly, but you can edit a SubTool or load a ShadowBox model as a SubTool. With the Ghost Transparency mode activated, you will be able to see all visible SubTools while in ShadowBox but will not be able to edit them. This is an easy way to create props or base meshes with the help of other SubTools as a reference. Two SubTools displayed with transparency while creating a new mesh In ShadowBox. Using references on working planes. The ShadowBox working planes are default 3D planes which include UVs. This means that you can load a texture and apply it to the planes directly so that the image can be used as a reference. Another solution is to use PolyPaint to paint directly on the planes. This can be done via SpotLight or with the traditional method of PolyPainting. A texture which displays a grid and the three working plans names, applied to the ShadowBox. You need to create the alpha so that it matches ShadowBox’s UV mapping. To do this, load the ShadowBox128 project from Lightbox, go to the Tool>Texture Map menu and press Clone Txtr. This will copy the texture map to the Texture palette from where you can export it. Load the ShadowBox texture map into your image editor. Use the map as a guide for creating your alpha. Load the alpha into ZBrush. With ShadowBox loaded, clear any masking by Ctrl+click+dragging the canvas background. With your alpha selected in the Alpha palette, press Tool>Masking>Mask By Alpha. Ctrl+click in ShadowBox to get it to update. Each ShadowBox working plane has a different Polygroup. This means that you can hide any or all working planes at any time (except for the active plane) by Ctrl+Shift+Clicking on the desired plane. Each working plane has its own polygroup, ready to be hidden. Using this workflow will allow you to focus on one plane at a time and then later bring one or both of the other planes back as one ShadowBox. It is also possible to use the new Unwrap UV feature in the Tool >> UV Map menu to unfold ShadowBox for flat painting. When you click on Unwrap UV again ZBrush will create a mesh where the masking on your three planes intersects. ShadowBox is designed to create base meshes rather than finely detailed models. Most of the time, it’s better to create a rough model with few polygons, then subdivide and sculpt it with traditional tools rather than trying to create your object entirely using ShadowBox. If you need to create holes, do it directly in ShadowBox by using Ctrl+Alt to erase part of the mask. Don’t forget to use the new masking Brushes to create accurate shadows. They can be combined with the new stroke functions to create perfect circles and more. ShadowBox works fine with Symmetry, based on an axis or with the Radial (R) option enabled. If your symmetry is off axis, don’t forget to enable the Local Symmetry option located in the Transform palette.